The DM & E Railroad expansion project was an important local issue in the 2006 CD-1 race, and it may not go away in 2008. Jeff Pieters at the Rochester Post Bulletin covers a new development in Rochester Coalition raises ethanol as growing railroad concern. Mayo Clinic submitted its comments today as part of the STB’s formal review of the proposed Canadian Pacific-DM&E merger. The merger is expected to create a new single service rail option that has the potential for significant growth regardless of the viability of PRB expansion. If current Canadian Pacific projections hold, DM&E’s Iowa, Chicago & Eastern line has the potential to originate more than 36,000 carloads of ethanol annually by 2010. Increased traffic generated by the merger is expected to move through Rochester on its way to and from the Canadian Pacific’s interchange point at Minnesota City. The Canadian Pacific has suggested that it will initially spend approximately $300 million over the next several years on making improvements to the existing DM&E rail line, but it is unclear where or how that money will be spent, or whether it will benefit Rochester in any way. It also is unclear whether $300 million is nearly enough to improve DM&E’s dilapidated rail line. Ten years ago DM&E claimed more than $800 million was needed to address significant deficiencies in its track and structures. Today’s Mayo Clinic filing also brought to light contradictory statements from DM&E’s current and future owners about the proposed PRB expansion. Since announcing its decision to purchase the DM&E, the Canadian Pacific has maintained that it has not yet decided to move forward with the PRB expansion. However, the DM&E continues to aggressively advance the project. In January, GOTRAC, an organization supporting DM&E, sent a letter to the South Dakota Legislature urging swift action to pass a bill that would accelerate the condemnation of private land for the PRB expansion. The DM&E’s rail tracks bisect the city of Rochester and pass within just a few hundred feet of Mayo Clinic, a leading international medical destination with more than 1.4 million outpatient patient visits annually. Currently, two to three slow-moving DM&E trains pass through Rochester daily. The proposed PRB expansion would create a major rail way through downtown Rochester with more than 34 trains bisecting the city daily while carrying vast amounts of coal and hazardous materials at speeds in excess of 50 miles per hour. The federal Surface Transportation Board is scheduled to issue a final decision on the Canadian Pacific’s DM&E acquisition by Sept. 30, 2008. For nearly a decade, the DM&E has pursued a major rail expansion though parts of southern Minnesota and South Dakota in order to haul large amounts of coal from Wyoming’s Powder River Basin to distribution points in the East. Unable to secure private financing for the project, DM&E sought the largest federal loan to a private company in American history – a $2.3 billion loan from U.S. taxpayers to finance a major rail expansion project through the Midwest. On Feb. 26, 2007, the Federal Railroad Administration (FRA) denied the DM&E's $2.3 billion loan application citing that the loan would have posed an unacceptably high risk to federal taxpayers. 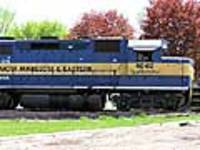 In early September 2007, the Canadian Pacific announced its acquisition of the DM&E. The Rochester Coalition is committed to protecting the people of Rochester and the patients and staff at Mayo Clinic as well as other affected communities. The Rochester Coalition represents the city of Rochester, Olmsted County, the Rochester Area Chamber of Commerce and Mayo Clinic. Mayo Clinic today asked the U.S. Surface Transportation Board (STB) to require mitigation for the city of Rochester as a condition of the Canadian Pacific’s pending acquisition of the Dakota, Minnesota & Eastern Railroad (DM&E). The proposed merger currently ignores the significant environmental impacts created by combining the two railroads, including the consequences of increased shipments of ethanol and other hazardous materials on what are universally considered to be unsafe tracks. The STB has previously ruled that it will require mitigation only if the Canadian Pacific decides to proceed with DM&E’s controversial Powder River Basin (PRB) expansion proposal.